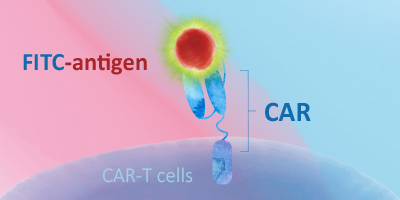 The chimeric antigen receptor T (CAR-T) cell therapy is a new treatment for a variety of cancers.The idea is to take the T-cells from the patient, and genetically engineer the cells to express a chimeric receptor (CAR) which recognizes a specific tumor-associated antigen (TAAs). As a result, the CAR-expressing T cells, when reintroduced into the patient's body, will target and eliminate the TAA-expressing tumor cells. ACROBiosystems has developed an extensive collection of recombinant proteins to support CAR-T therapy development. 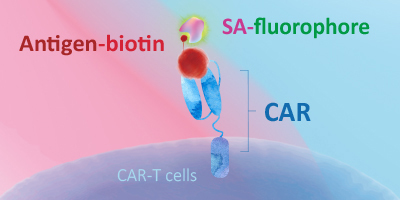 This growing list of proteins includes many fluorescent-labeled target antigens and pre-biotinylated proteins that are uniquely suitable for evaluation of CAR expression. In addition, we also supply difficult-to-express proteins such as BCMA, CD19, ROR1, and EGFRVIII. Target antigens are pre-labeled with a fluorescent dye. Processing time can be reduced by the use of direct-labeled proteins. Non-specific reaction of a secondary antibody is eliminated. 293 cells were transfected with anti-CD19-scFv and RFP tag. 2e5 of the cells were stained with B. FITC-Labeled Human CD19 (20-291) (Cat. No. CD9-HF2H2, 10 µg/ml) and C. FITC-labeled protein control. A. Non-transfected 293 cells and C. FITC-labeled protein control were used as negative control. RFP was used to evaluate CAR (anti-CD19-scFv) expression and FITC was used to evaluate the binding activity of FITC-labeled Human CD19 (20-291) (Cat. No. CD9-HF2H2). Target antigens are pre-labeled with biotin and detected by labeled streptavidin (the biotin-avidin complex). Streptavidin labeled with fluorochromes can bind biotinylated proteins with a high degree of affinity and specificity, amplifying the signal and improving the detection sensitivity and specificity. 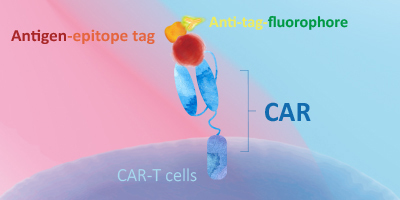 Target antigens are designed to carry a specific tag and detected using a secondary antibody (anti-epitope tag antibody) labeled with a fluorophore. Non-specific reaction of a secondary antibody may occur. 293 cells were transfected with FMC63-scFv and RFP tag. 2e5 of the cells were first stained with B. Human CD19 (20-291) Protein, Fc Tag, low endotoxin (Super affinity) (Cat. No. CD9-H5251 , 3 µg/ml) and C. Human Fc Tag Protein Control, followed by FITC-conjugated Anti-human IgG Fc Antibody. A. Non-transfected 293 cells and C. Human Fc Tag Protein Control were used as negative control. RFP was used to evaluate CAR (anti-CD19-scFv) expression and FITC was used to evaluate the binding activity of Human CD19 (20-291) Protein, Fc Tag, low endotoxin (Super affinity) (Cat. No. CD9-H5251).